Stock photo of two ice picks lodged in a frozen wall of ice at the Upper Falls during winter, Johnston Canyon, Banff National Park, Canadian Rocky Mountains, Alberta, Canada. 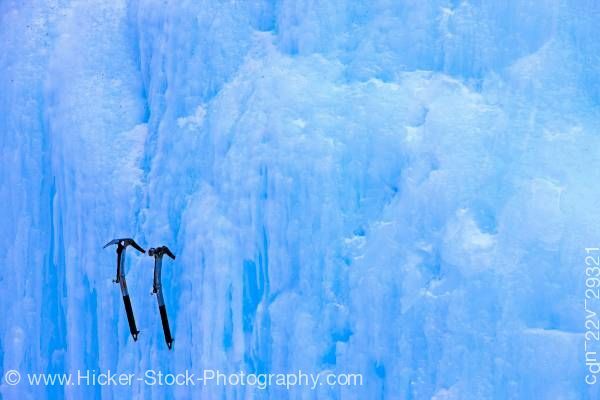 This stock photo includes two ice picks lodged in a frozen wall of ice at the Upper Falls during winter, Johnston Canyon, Banff National Park, Canadian Rocky Mountains, Alberta, Canada. Banff National Park forms part of the Canadian Rocky Mountain Parks UNESCO World Heritage Site. Certainly an area that shows the power of nature and time - rushing water carves a path through the limestone canyon and potholes form over the years from plunging waterfalls. This is one of the most popular hikes in Banff National Park. Enjoy a guided ice walk through Johnston Canyon where you will travel along the path of the water that began carving the canyon 8000 years ago to the frozen upper falls of Johnston Canyon.